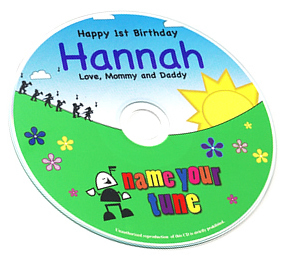 This CD from Name Your Tune is a fresh and exciting children's music compilation that is made to order and features your child's name more than 80 times throughout the 14-song CD. The songs include children's tunes that we all know and love. 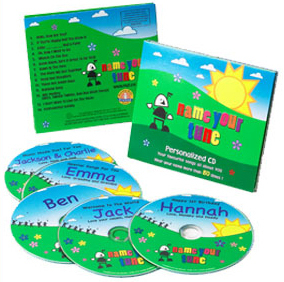 We can incorporate multiple names on a Name Your Tune CD...with pleasure. There is no extra cost to have more than one name included throughout our songs. To do this, we alternate songs between the names. When you place your order, simply put the names in the space indicated. All orders will be shipped within 7-10 days! Browse our full catalogue of available names. 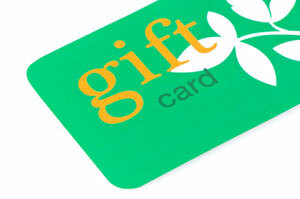 Have questions about ordering your Name Your Tune CD? See our FAQs for answers. Just Because We Love You, or Welcome to the World.